TERRE HAUTE, Ind. 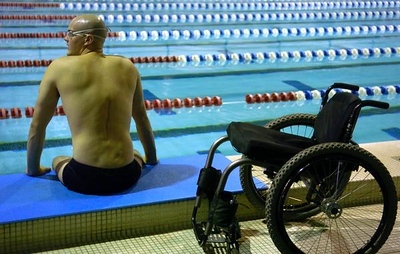 -- Indiana State University will bring Paralympic swimmer and motivational speaker Dave Denniston to Terre Haute March 18 as part of the University's Disability Awareness Month. Denniston, a former Auburn University swimmer, was a world class competitor in the 100 and 200 meter breaststroke events. He was on many national teams, in addition to breaking American and World Records. He tried to make the USA Olympic team in 2000 and 2004 and missed by two positions. Then, in February 2005, he had an accident that paralyzed his once powerful legs. He broke his back and sustained a spinal cord injury. After surgery to fuse his broken vertebra, and several months of rehabilitation and being confined to a wheelchair, he is facing the challenges of his new life. He was one of 213 athletes representing the U.S. in the 2008 Paralympic Games, an elite sporting event for persons with physical disabilities, in Beijing. Denniston, who has been swimming since age 8, will conduct a swim clinic at the Terre Haute South High School pool for youth in elementary, middle and high school students from 3-4 p.m. on March 18. The clinic is free and open to the public, with a maximum of 50 students allowed. To register for the clinic, email Jeff Thompson, swim coach at Terre Haute South Vigo High School, at jat@vigoschools.org with the student's name, age, address, phone, email, and name of school attending. Swimmers must register in advance. With humor and poignancy, Denniston will share his message of hope, positive attitude, and encouragement in a motivational presentation titled "Mind over Body" beginning at 5:30 p.m. that evening in Hulman Memorial Student Union, Dede I. The presentation is free and open to the public. Copies of his instructional DVD will be available for sale and signing. Free-will offerings also will be accepted for the National Transplant Assistance Fund (www.transplantfund.org ), which helps pay for medical treatment for persons who've suffered from catastrophic events. Denniston's visit is sponsored by Indiana State's Disability Awareness committee, ISU's Office of the President, ISU's Student Union Board, Terre Haute Torpedoes Swim Club, Happiness Bag Inc., Terre Haute South Vigo High School and ISU's Office of Recreational Sports. For more information about the swim clinic or the presentation, contact Maria Greninger at (812) 237-4357 or via email at mgreninger@indstate.edu or go to http://www.indstate.edu/disability/events.html . Indiana State University will bring Paralympic swimmer and motivational speaker Dave Denniston to Terre Haute March 18 as part of the University's Disability Awareness Month.